Chronic vs. aggressive periodontal disease. A look into the different types of periodontitis that can develop if your gum disease is left undiagnosed and untreated. The basics: what is periodontal disease? It is reported by the NHS that in the UK, up to 15% of adults are estimated to have severe periodontitis , with many more affected less severely. Generally speaking, periodontitis develops when an earlier stage of gum disease, usually characterised by bleeding and inflamed gums is left untreated and undiagnosed. Periodontal disease is a serious dental condition and a delay in diagnosis and treatment can unfortunately cause premature loss of teeth and the need for restorative dental treatment which is both expensive and uncomfortable. Chronic periodontitis is a common disease of the gums consisting of chronic inflammation of the periodontal tissues which is caused by the accumulation of large amounts of dental plaque. In the early stages, chronic periodontitis has few symptoms. Individual may suffer with bleeding gums, inflammation of the gums and bad breath. The progression of the disease is generally relatively slow. Later on in the progression of the disease, patients will usually demonstrate deep pockets between the teeth and the gums, demonstrating a loss of attachment of the periodontal tissues. If untreated, patients are also likely to suffer with bone destruction around their teeth, eventually leading to the loss of teeth. Patients are at greater risk of developing chronic periodontitis if they smoke or have poor oral hygiene. The progression of this form of the disease is much more rapid and patients often display a different pattern of bone loss compared to this suffering from chronic periodontitis. Treatment for aggressive periodontal disease largely involves early mechanical therapy from dentists and the use of antibiotics. Whilst excellent oral hygiene can treat and stop the progression of chronic periodontitis, given the nature of aggressive periodontitis, more invasive treatment is required to halt the progression of the disease. The delay in diagnosis and treatment of periodontal disease (including both the aggressive and chronic forms) is one of the most common claims we see and often the most serious. I have recently obtained £70,000 in compensation for my client, whose dentist had failed to diagnose and treat aggressive periodontal disease over a twenty year period. As a result my client lost sixteen teeth and required complex and expensive restorative work to replace his missing teeth. 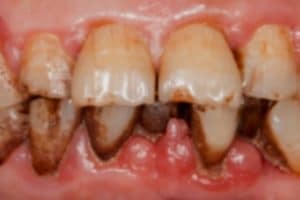 Whilst this is one of the most serious examples of undiagnosed aggressive periodontal disease I have dealt with, periodontal disease at all levels of severity can have devastating effects on your teeth if it is not diagnosed or left untreated. If you have suffered from dental problems which were not diagnosed by your dentists, please contact the Dental Negligence Team who will be happy to assist and advise on the prospects of bringing a dental negligence claim.